The cause of the derelict Arrowview Hotel fire "appears to be an electrical failure," Port Alberni fire Chief said. Apr. 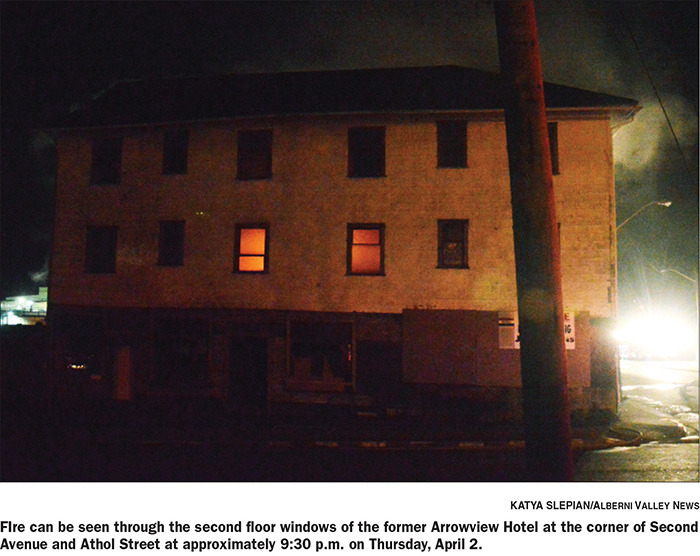 3, 2015 5:00 p.m.
An electrical failure appears to be the cause of the fire that started in the former Arrowview Hotel on the night of Thursday, April 2, according to Port Alberni fire Chief Tim Pley. The Sproat Lake and Beaver Creek fire departments responded through their mutual aid agreement with the city’s department. Crews searched the entire building to ensure that there were no victims inside at the time of the blaze. The PAFD has secured the structure and returned custody to the owner.